So many different nacho cheese dispensers to choose from! 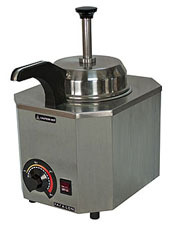 We offer nacho cheese dispensers and machines from Server Products and Gold Medal. 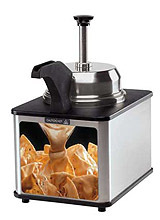 Each of the nacho cheese dispensers has it's own unique way of dispensing nacho cheese. Our Server Products stock numbers include 81140 & 86500. The Gold Medal nacho cheese machines include, GM2191, GM5300, GM2206, GM2197, and GM2185 & GM 2186. Look for the selection of nacho chip warmers too! 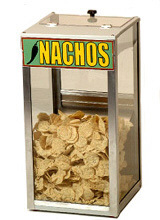 From small to large, Gold Medal, Paragon, Benchmark, & Server Products, you are sure to find a nacho chip warmer that will give you years of service. Not sure weather to choose the ladled nacho cheese dispenser machine or a heated pump nacho cheese dispenser machine. 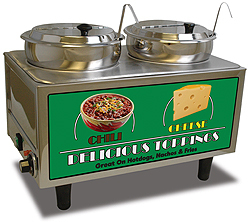 Check out both models of nacho cheese machines. Remember, the ladled nacho cheese dispensers tend to be a little more messy. 95% of our customers choose a heated spout machine. Also, it makes a good impression with many food inspectors. So many different nacho cheese dispensers to choose from! 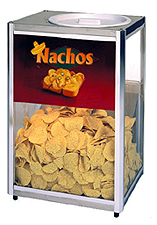 We offer nacho cheese dispensers and machines from Server Products and Gold Medal. 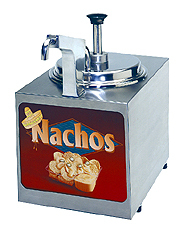 Each of the nacho cheese dispensers has it's own unique way of dispensing nacho cheese. Our Server Products stock numbers include 81140 & 86500. The Gold Medal nacho cheese machines include, GM2191, GM5300, GM2206, GM2197, and GM2185 & GM 2186. Look for the selection of nacho chip warmers too! 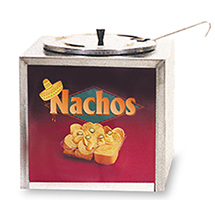 From small to large, Gold Medal, Paragon, Benchmark, & Server Products, you are sure to find a nacho chip warmer that will give you years of service. Not sure weather to choose the ladled nacho cheese dispenser machine or a heated pump nacho cheese dispenser machine. 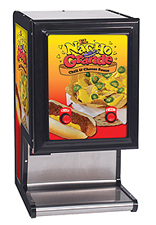 Check out both models of nacho cheese machines. Remember, the ladled nacho cheese dispensers tend to be a little more messy. 95% of our customers choose a heated spout machine. Also, it makes a good impression with many food inspectors.